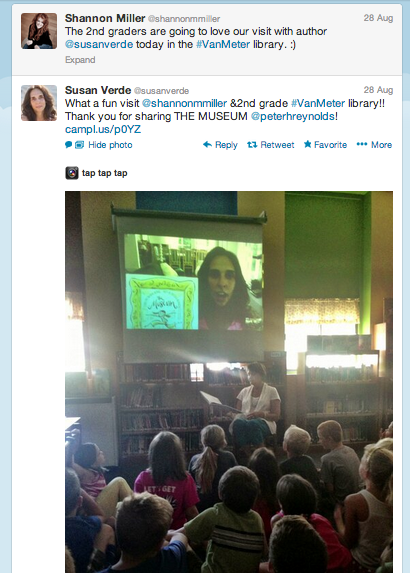 When school started a few weeks ago, our 4th and 5th graders also started their Related Arts Student Portfolio Blogs. We are using KidBlog for the platform which they are posting to in art, music, and the library (You can read about their student portfolio blogs here). Another goal for this year that our two 5th grade teachers Kate Goodwin and Aubrey Stafford, along with our colleague Bart Jones who is the elementary PE teacher and myself, is for all of the students to have a digital portfolio. This is a pilot within our elementary and a goal for all of our students K-12 next year at Van Meter. 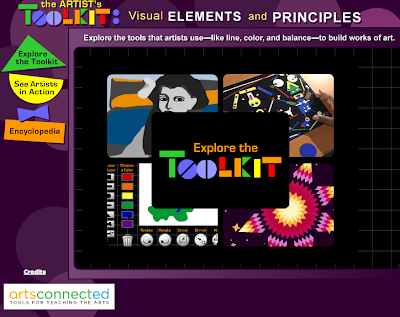 Each student will share their learning, creating, and voice within their digital portfolio. We decided to use Google Sites for their portfolios. They each have an iPad with them throughout the day and access to laptops in the classroom and library. The 5th graders started their Google Site in the library last week. I walked them through the steps and each one created their own. We love working together in front of the screen.....they can follow along with me very easily. Also, working together as a group they also become the teachers, helping and teaching their classmates. 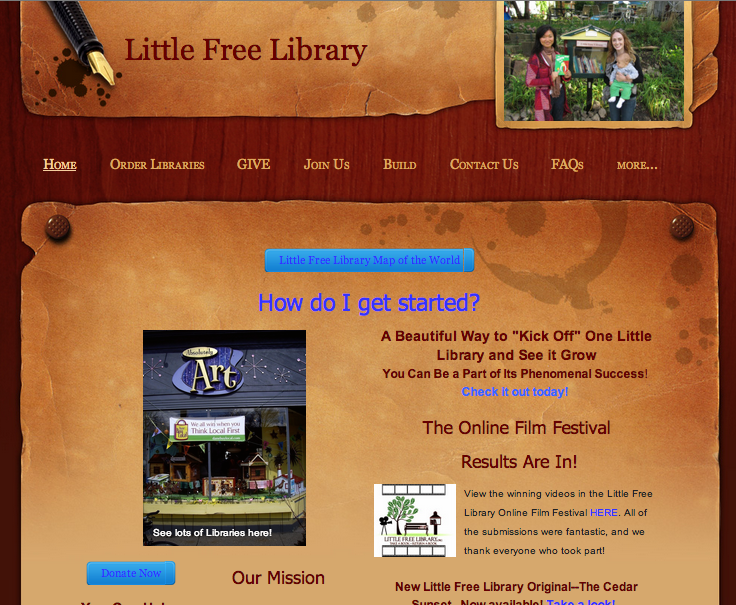 Once their Google Site was created they had fun personalizing it by changing the theme, color, fonts, and adding a picture of themselves on the home page. I love seeing them use PhotoBooth on the MacBooks and PicMonkey online to create the perfect picture to represent themselves! By the end of the time in the library, every one of the 5th graders had a place that was just for them. 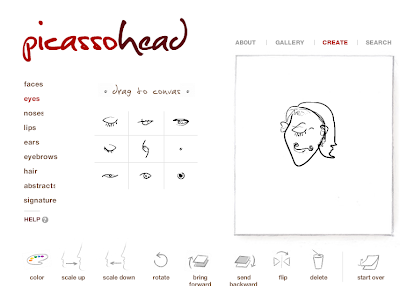 They also had created a page for their Related Arts Portfolio Blog....we will add these next week. I want these portfolios to be all them.....Truly letting their passions, voice, and talents shine through. Through their portfolio work we will see our students produce and publish work that they are proud of, work that they will want to share with others. These will follow them through their secondary years. It will be really inspiring and important to see how they are develop into young people ready to change the world. And a new place to share their learning, creating, and voice. The 4th Grades Created And Made 3D Dots Come To Life In The Library Today! This morning these pictures caught my eye. They were on Peter Reynolds Facebook page. 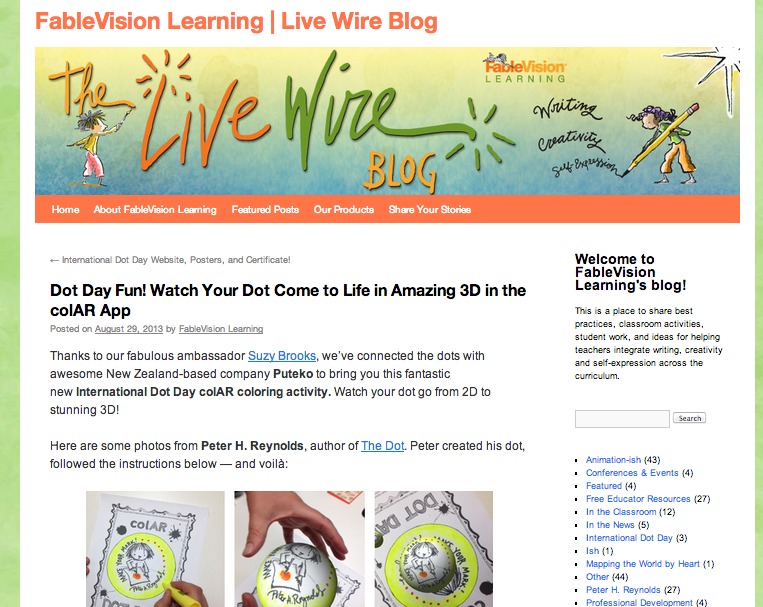 I wanted to know more about what Peter had created so I went to the FableVision Learning Live Wire Blog. "Thanks to our fabulous ambassador Suzy Brooks, we've connected the dots with awesome New Zealand-based company Puteko to bring you this fantastic new International Dot Dot colAR coloring activity. 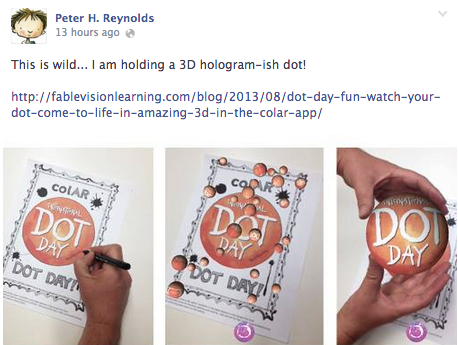 Watch your dot go from 2D to stunning 3D!" I then went to the colAR App webpage to read and watch more on how on this app works. It is amazing! 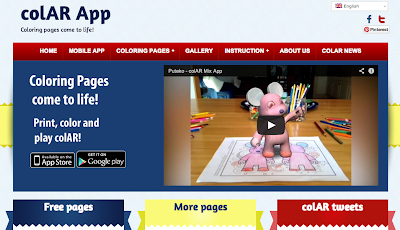 On this website you can get "Free Pages" and "More Pages" to color and use with the app. This is where you can also get the special page they created for Dot Day. I printed it off at home and copied it at school for the kids to try out in the library today. I was so excited to show them the YouTube video that would explain the how to create an animated coloring sheet too. Now they really couldn't wait to create 3D pictures too! I gave all of them the special colAR Dot Day coloring sheet and they set off to create. They used markers and crayons to create beautiful drawings to celebrate Dot Day. Then they used my iPad and iPhone (which I downloaded the free colAR Mix app onto both) to scan their drawing. They investigated the buttons within the app as they used it too. Then their drawing came to life....twirling, spinning, multiplying, and turning into 3D objects. They were hooked and couldn't wait to add this app onto their iPads. CLICK on the picture above to see Chaney's beautiful artwork come to life! CLICK on the picture above to watch Casey and the 3D drawing he created to celebrate the Van Meter Football Teams first game tonight. The 4th graders did a terrific job taking turns with the iPad and iPhone. They also loved watching on with everyone so they could see how their dots looked too. They have already asked to do more when they come back next time. We will use our Apple TV next week so everyone can see them when we share. We will be hanging their colAR drawings in the hallway in our "Make Your Mark Museum" along with the QR Codes to the Vine videos (to get the Vine app go here and also learn more). We can't wait to see what all of you create too! 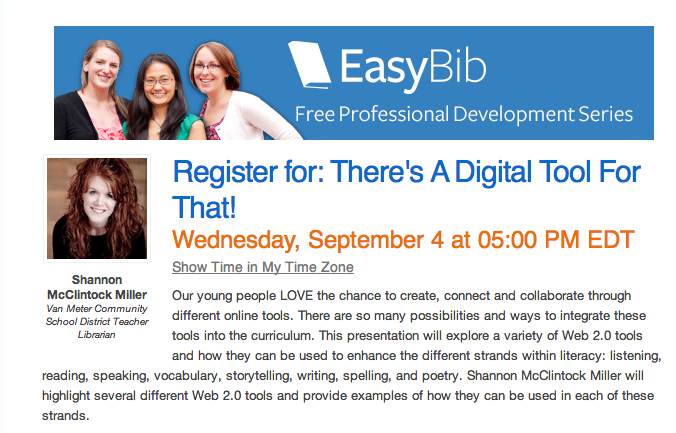 Join Me Today For The EasyBib Free Professional Development Series Webinar...."There's A Digital Tool For That!" 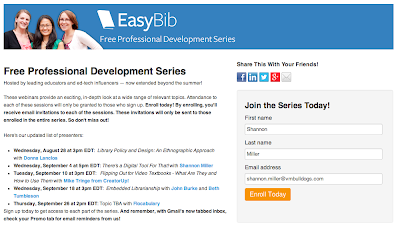 Today I am excited to be presenting for the EasyBib Free Professional Development Series. At the BLC Education Conference in Boston this summer, I had a great time creating and presenting There's A Digital Tool For That! and thought it would be a fun theme for back-to-school time. You can register for the webinar here. I hope to see you....It will be filled with ideas and inspiration to kick off another amazing year. 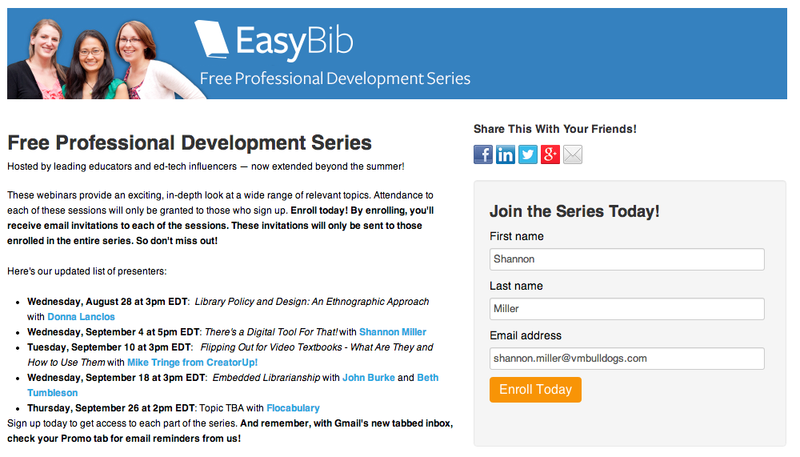 You can learn more about the entire EasyBib Free Professional Development on their website and sign up for the series. 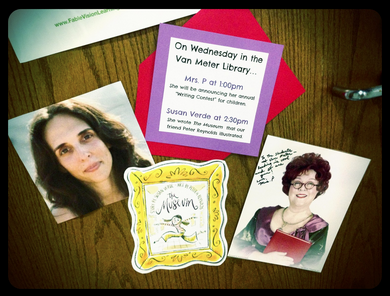 There have been several wonderful webinars already....You won't want to miss them. Mrs. P and Susan Verde! Mrs. P, from Mrs. P's Magic Library, has been connecting with our students and school community for the last few years....We always love her visits so very much (a post about her visit will come right after this one). 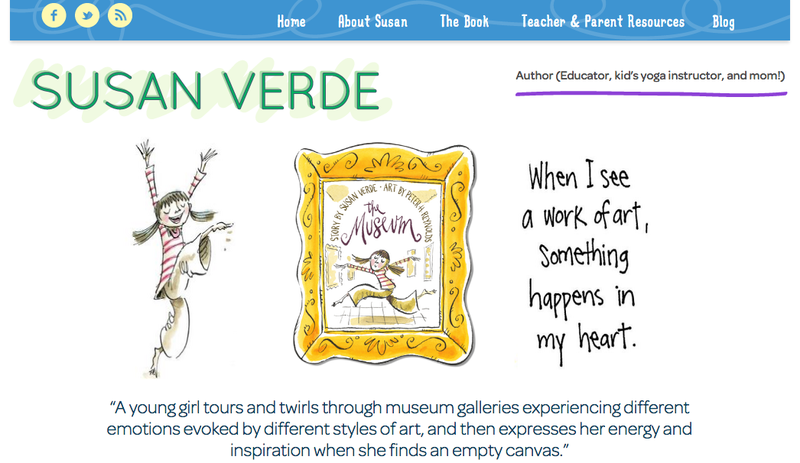 When Susan's book The Museum came out earlier this year I couldn't wait to read it and add it to our library. It is a beautiful story and to make it even more fantastic.....my dear friend Peter Reynolds illustrated it. It was an instant favorite. 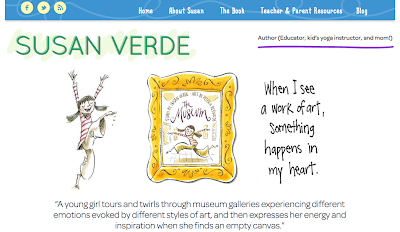 I have always loved art and museums, just like the little girl in the book. And I share this love for art and artists with my students in the library every chance I get. For our related arts blocks, the art teacher has half of a grade level and I have the other half for library and technology time. It is nice for planning special events like this. My friend Shelley Broderick, one of our art teachers, brought her half of the second grade to the library so they could also enjoy Susan's visit. It was very special listening to Susan read her book and share Peter's illustrations. After Susan read, the 2nd graders had so many questions...It was fun listening to the conversation between all of them. They told stories of their favorite artists, art works, and museums too. When we finished our Skype with Susan, the second graders and I wanted to do a little creating of our own. Since we have been making plans for our Dot Day Celebration in September, they instantly said "Let's make our very own DOTS for Dot Day!" And then one little friend said, "Can we make a museum for our DOTS too? Just like the one in Susan's book?" From the first day of school we have talked about how we are going to "Make Our Mark On The World" this year.....this is just one more way we can celebrate who we are! 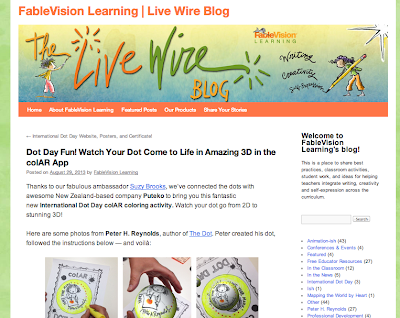 You can sign up here to participate in International Dot Day too! 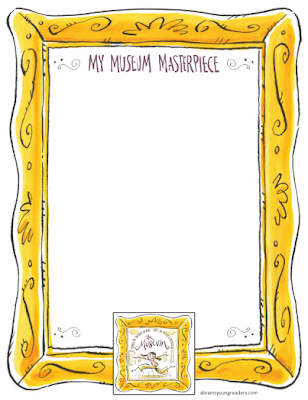 I can't wait to show off all of the amazing art work in our "Make Your Mark Museum!" 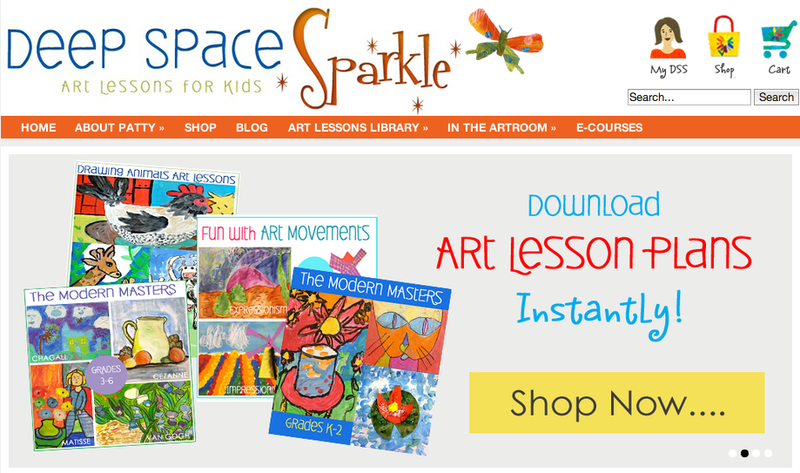 Susan has a wonderful website....I just love all of the resources she has available under "Teachers & Parent Resources". 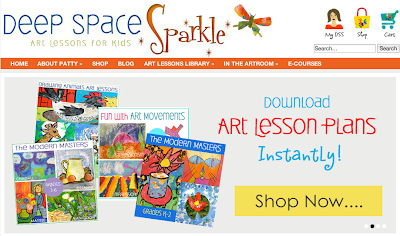 These are resources for children and teachers to use at school and also for parents to use with their families at home. 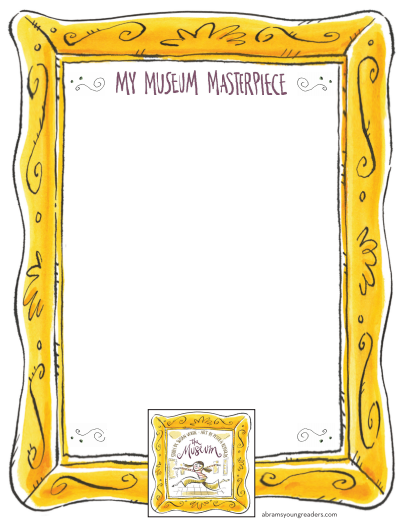 I have download this beautiful "My Museum Masterpiece" from the website here and we will be using these for the "Make Your Mark Museum". These will be perfect for Dot Day or any day. and The Artist's Toolkit are websites all of the students and teachers will enjoy. I also bring videos into the library to enrich books and projects....and the connection with The Museum is a perfect fit with this type of resource. The YouTube Channel "Getting To Know" has several great ones about artists. They really have enjoyed watching these and connecting to artists we learn about. Thank you for visiting our library Susan. It was great fun and very special to all of us. 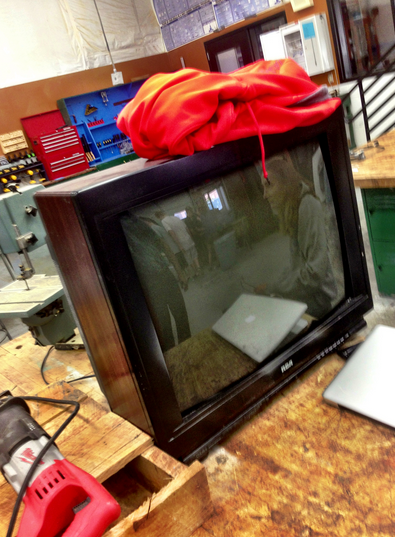 Our First Little Free Library At Van Meter....And It's Made From An Old TV!?!?! We have a new industrial technology teacher at Van Meter, Chriss Barck. A couple days after we started back to school Chriss visited the library and we became colleagues and friends. I am so happy he is here with all of the students and teachers....what a great addition to Van Meter. And during those first few days I also asked him to help me get a project off of the ground that I have wanted to do within our community. I told Chriss all about Little Free Libraries and hoped he would say he was all for getting students involved in this project too! 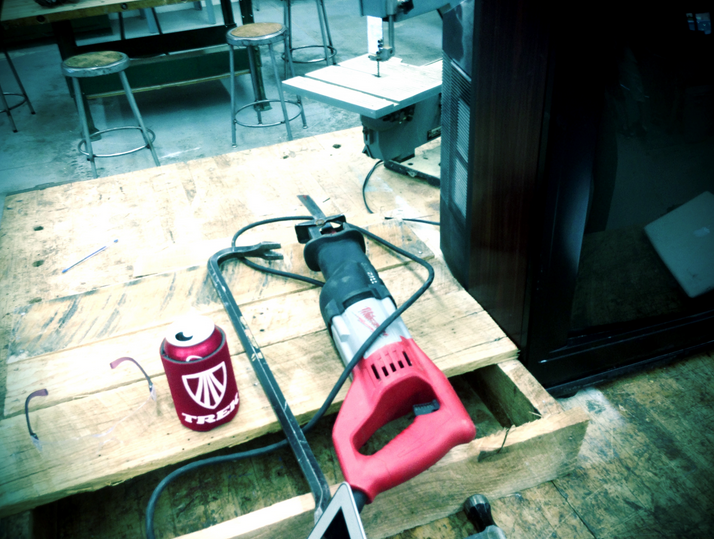 We would have them design, build, and do the finish work on the project as Chriss taught and mentored the students. Other teachers and classes, such as art, could get involved too and we could make this a K-12 project that would benefit the entire Van Meter Community. Last week, Lisa Boyd, a parent and my friend, texted me and said she was dropping off an old TV in the shop.....This conversation came out of one last year. We both thought it would be so cool to build something for books out of an old TV. Now she had one ready for us to use. When I stopped out in the shop to touch base Chriss had the tools ready to take everything out of the TV and get it ready for its "Little Free Library" transformation. Yesterday I got a wonderful surprise in the library! Colton Boswell, who is a senior at Van Meter, carried our new Free Little Library into the library. He was so proud of the Free Little Library and what he had created. 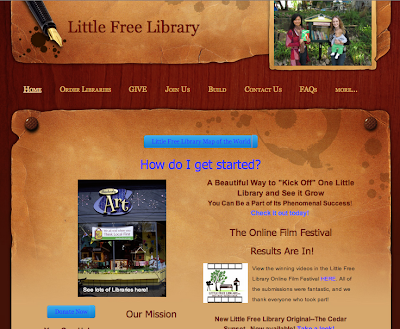 For more information about Little Free Libraries you can visit the website at Little Free Library. This is where you register your libraries too. I also came across the Little Free Library Pinterset which has dozens of beautiful ideas. Also, a few nights ago on Twitter my friend and colleague Eric Trudo sent me this map that shows where all of the Little Free Libraries are located. I will have Colton add ours today. Thank you Colton and Chriss.....This is going to be such a fun addition to our school and will inspire reading even more throughout our community. You two are awesome. I can't wait to see what we do with this project next. They Loved It! Remind101 Was A Fun Success!